I should have learned this lesson before now. I’ve been weaving for some time, so of course wherever I go I tend to notice weaving-related phenomena. However, since I started blogging, I’ve gone beyond noticing and maybe snapping a few pictures–now I really look, take a lot more pictures, ask questions and generally try to craft a short story out of what I am seeing. Which has led me to the conclusion that weaving is everywhere. It makes sense that this is so. It is one of the most ancient crafts still practiced by human beings. We still need cloth, and there is no better way to get it than from some kind of loom. 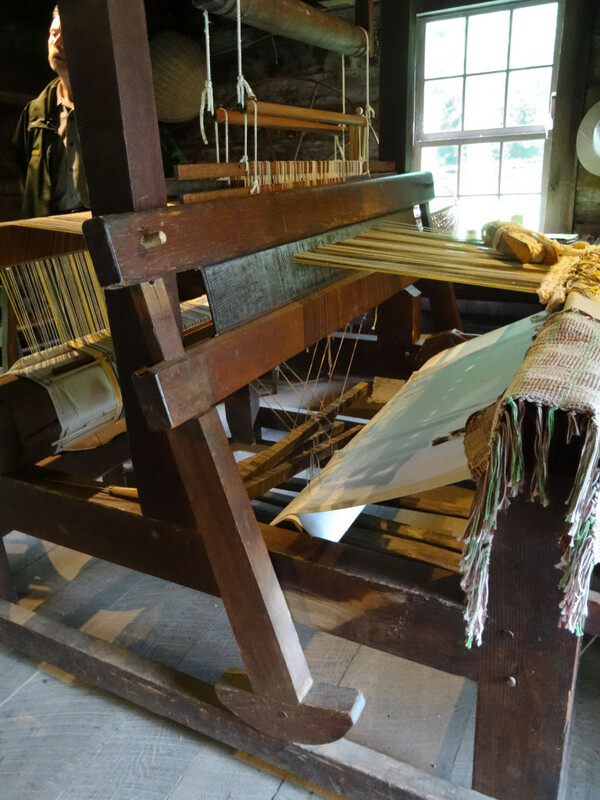 So it is not surprising that many historical sites have some kind of display or information about weaving. 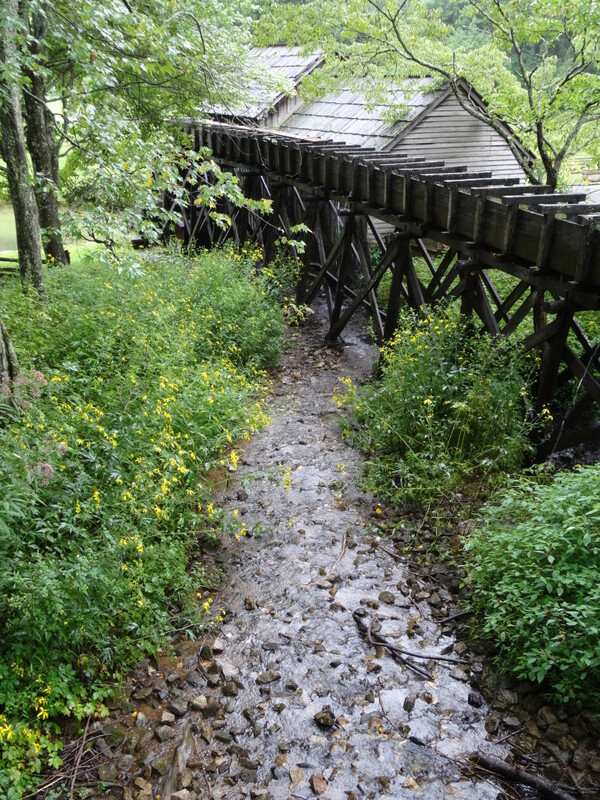 But when I visited Mabry Mill on the Blue Ridge Parkway in Meadows of Dan, VA earlier this month, I wasn’t expecting anything. 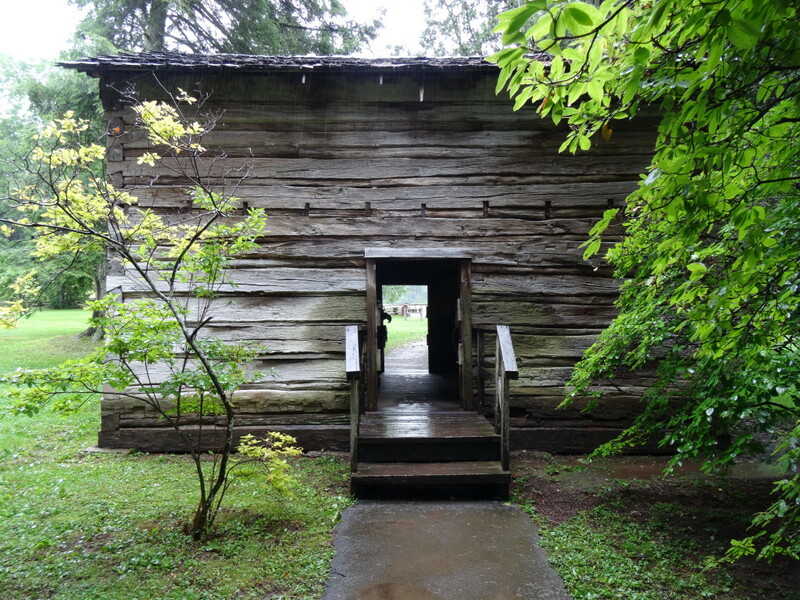 I have been there many times, occasionally seen the mill wheel in operation, followed the path through the blacksmith shed set up in historically accurate fashion, and then on to the mill building itself. I especially enjoy buying traditionally ground grits in the gift shop to use at home (if you like grits, try these if you can get them). 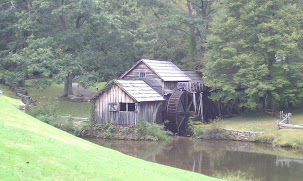 I was happy as we approached the mill to see we had visited on a day when the mill was working. 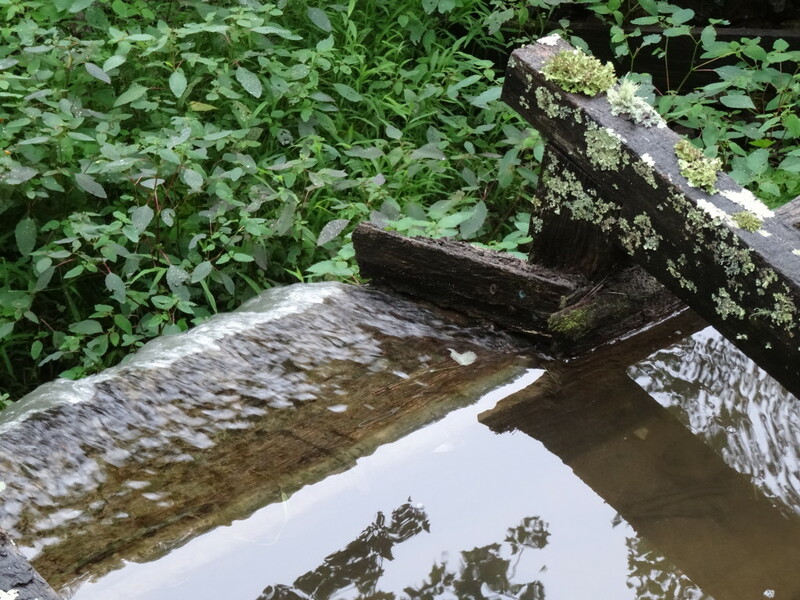 The millrace was full of water (and leaking extensively) and the big wheel was turning. 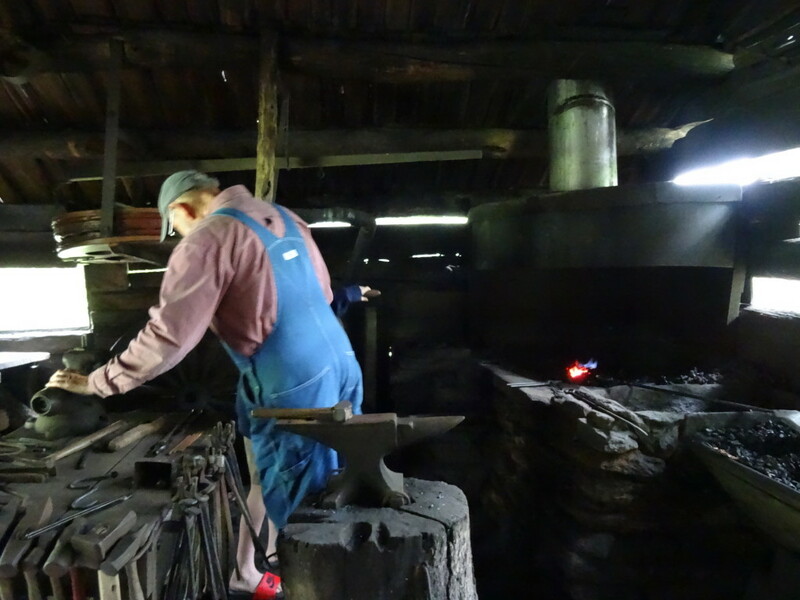 Even better, as the path wound around to the blacksmith’s shed, we saw that there was a real live blacksmith in residence. A certain young member of our party, whose feet are visible in the photograph below, harbors dreams of blacksmithing one day, so this was especially significant. 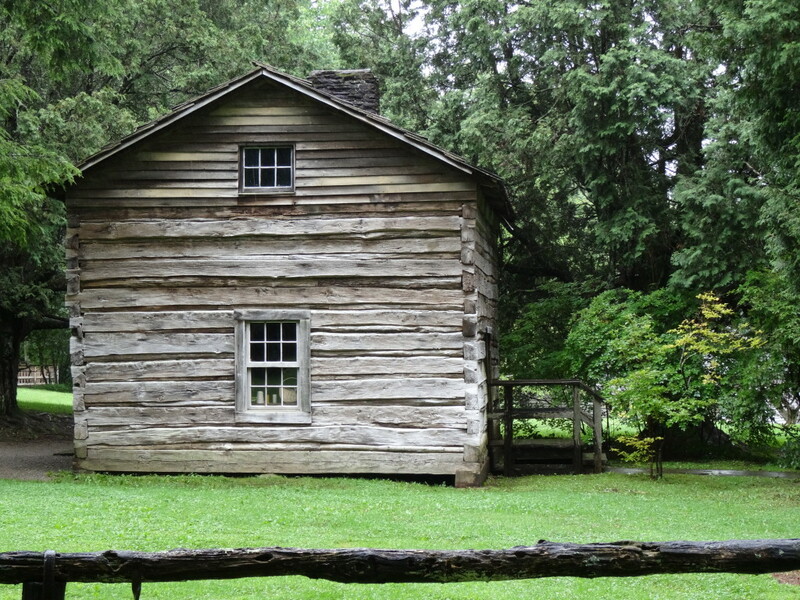 We then noticed that this log house was open and occupied. This is the original loom to the cabin and, like the cabin, is about 150 years old–and still in use today. Just ask Diane Garland, who was sitting in the cabin and tearing strips for a rag rug when we walked in. 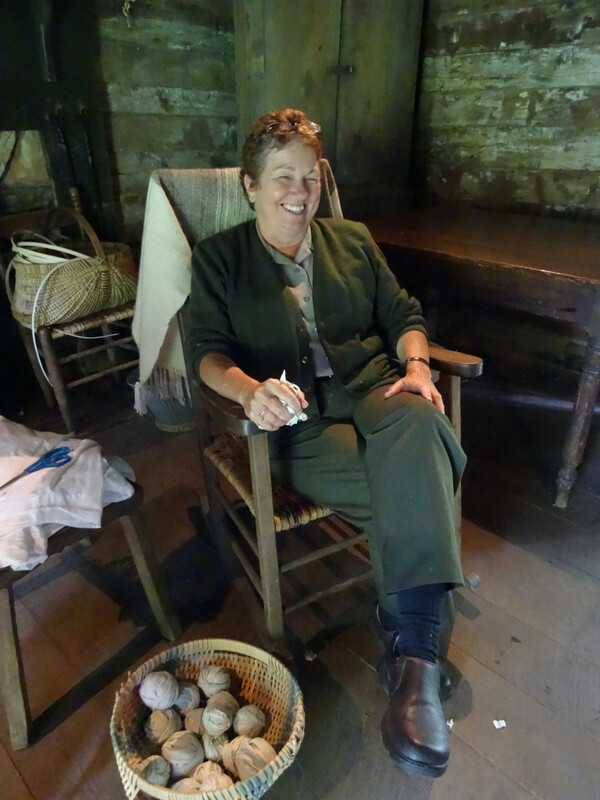 Diane is a weaver from Fancy Gap, VA who learned how to weave about thirty years ago through her work at Mabry Mill and from books. At home, she likes to make scarves and rugs, and her special interests include traditional coverlets and, recently, Saori weaving. 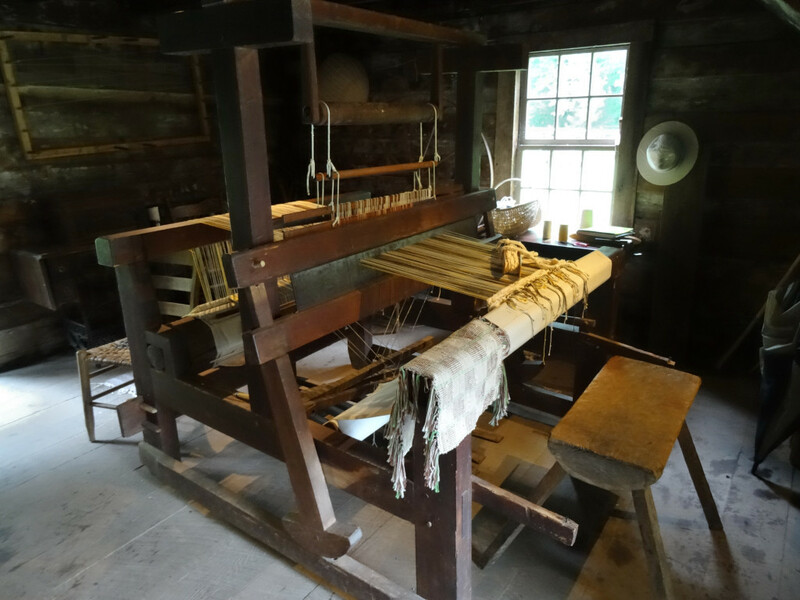 Diane told me that the Matthews cabin loom, which has four harnesses, was fairly typical for the time and place, and would have been used for rag weaving, yardage and coverlets. It also would have resided in a weaving shed rather than the cabin proper. It was nice to accidentally discover this bit of weaving history, and to share it with you.